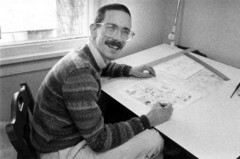 Nerds With Kids: Brand Spanking New BILL WATTERSON INTERVIEW! Brand Spanking New BILL WATTERSON INTERVIEW! There's some kind of poetic irony to this interview- Watterson's first in 15 years- appearing just days after the death of Salinger. Because your work touched so many people, fans feel a connection to you, like they know you. They want more of your work, more Calvin, another strip, anything. It really is a sort of rock star/fan relationship. Because of your aversion to attention, how do you deal with that even today? And how do you deal with knowing that it's going to follow you for the rest of your days? Ah, the life of a newspaper cartoonist -- how I miss the groupies, drugs and trashed hotel rooms! But since my "rock star" days, the public attention has faded a lot. In Pop Culture Time, the 1990s were eons ago. There are occasional flare-ups of weirdness, but mostly I just go about my quiet life and do my best to ignore the rest. I'm proud of the strip, enormously grateful for its success, and truly flattered that people still read it, but I wrote "Calvin and Hobbes" in my 30s, and I'm many miles from there. An artwork can stay frozen in time, but I stumble through the years like everyone else. I think the deeper fans understand that, and are willing to give me some room to go on with my life.